A line segment is a straight line which links two points without extending beyond them. In this article we’re going to develop three functions to work out equations of straight lines in Matlab with different approaches. At the end, we’re going to wrap those three functions in a menu, so that the user can choose the appropriate one, according to known data. Our first function assumes you enter points (x1, y1) and (x2, y2), and the function returns the slope m and the intersect b. Now, the following video shows you how to use the concepts of point and slope to find linear equations. After the video, we show you how to implement a function to easily achieve the equivalent results. Our second function in this task, assumes you enter point (x, y) and the slope. It returns the intercept. 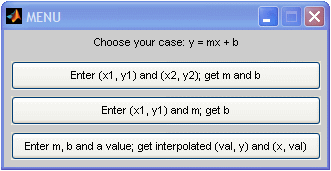 The third function interpolates an entered value. You enter the slope, the intercept and the value. The function returns the interpolated values.